The S&P 500's 9% pullback since January has exposed weaknesses in many stocks – stocks that are best to avoid. But it has also created an opportunity for investors to grab solid companies at prices that definitely won't last. One of the best places to look for those bargains is the regional banking sector. Thanks to three major industry tailwinds, this sector has been outperforming the rest of the market in 2018. 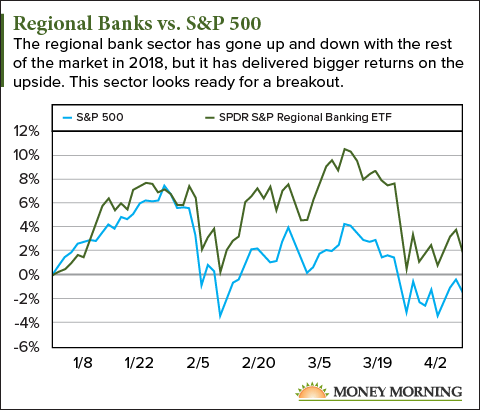 While the S&P 500 is down 1.7% this year, regional banks are up 1.6%. First, banks stocks are among the few that benefit from a rising interest rate environment like we're in now. The U.S. Federal Reserve has signaled it will raise rates at least three, possibly four, times this year. This means banks will be able to charge more on loans and increase their profit margins. Average 30-year mortgage rates have risen from 3.75% to 4.45% since late 2015, and another round of hikes by the Fed could bring that figure to 5.25% or higher. The second catalyst for bank profits is the recent federal tax overhaul. This particularly benefits regional banks. 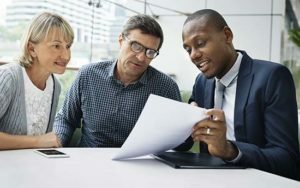 It simultaneously slows loan demand from big conglomerates – they're busy repatriating their money from overseas – and spurs loan demand from small- and medium-sized businesses. Finally, changes in federal finance regulation should improve regional banks' bottom line. A rare piece of bipartisan-supported legislation that has cleared the Senate aims to loosen restrictions on mortgage lending for small banks. It will also exempt more regional banks from the strict federal oversight originally intended for big Wall Street banks after the disaster of 2008. With that in mind, we've got five regional banks that are among the best of the best. Some of them go back to the 1800s and have weathered bank panics and the Great Depression. Others are surprising young upstarts. All of them are growing their earnings year after year. Plus, they all offer dividend yields above 1.50%. And each of them have earned the highest possible score on our Money Morning Stock VQScore™ system, indicating they are undervalued and poised for growth. Plus, none of these have reported Q1 earnings yet. Any significant earnings beats could serve as a fourth major catalyst. Here are the top five regional bank stocks ready to take off. Top Regional Bank Stocks, No. 5: Community Bank System Inc.
Community Bank System Inc. (NYSE: CBU) owns over 170 bank branches in Upstate New York, Pennsylvania, Vermont, and Massachusetts. It's been around for over 150 years, beginning with the St. Lawrence County National Bank chartered in 1866 in Canton, N.Y.
With a market cap of $2.7 billion and $11 billion in assets, CBU is the smallest firm on our list. But its earnings have grown every year since 2012, including 19.1% in 2017. Community Bank's profit margins are an impressive 29.72%, compared to an industry average 25%. The company's return on equity, at 10.64%, as well as its trailing P/E ratio of 17.65, also outperform the industry averages of 8.73% and 23.15 respectively. The stock has been range-bound over the last 12 months, moving back and forth between $49 and $59. It now sits just above $53. And if the company's P/E rose to match the industry's P/E ratio, the CBU stock price would climb over 30%. So when the stock market picks up again, CBU's solid financials and industry tailwinds should give it a significant boost. On top of that, you can collect a dividend yield of 2.50%. CBU will release its quarterly earnings report on April 25. Analysts are predicting earnings per share (EPS) of $0.73, up from $0.64 in the same quarter last year. Top Regional Bank Stocks, No. 4: Bank of the Ozarks Inc.
Because of its expanding footprint, plans are underway to rebrand the company as "Bank OZK" (with the updated ticker symbol OZK). CEO George Gleason was only 25 years old and had only $10,000 to his name when he bought a controlling share in the struggling bank in 1979. He then took it from $28 million in assets to $3.2 billion over the next 30 years. Gleason's company became the largest bank in Arkansas after the 2008 financial crisis, as its unwavering track record of profitability put it in a position to be a buyer rather than a seller. Today, OZRK has $20.8 billion in assets, and its profitability remains consistent. According to FactSet, the company is projected to grow its earnings by 25% in 2018. The stock has slipped from its mid-March high of $53, now around $46. But it has offered steady gains to long-term stockholders, rising 125% over the last five years. The forward P/E ratio of 11.25 falls well below the industry average of 16.87, suggesting Wall Street is undervaluing the stock. A rise up to the industry average would mean nearly a 50% boost in stock price. OZRK also offers a dividend yield of 1.61%. The company will release its quarterly earnings report on April 12. Analysts anticipate earnings of $0.88 per share, up from $0.73 a year ago. I would like to start this stratgegy to make extra money in retirement.